One of my biggest obsessions is brewing up a nice big bubbling, aromatic pot of herbs and spices to make a delicious and healing chai tea. Nothing gives me more pleasure than standing over my pot with my wooden spoon, poking away at the various pods, leaves, barks and seeds bobbing at the surface, just like a little Witchy-poo. Especially while it’s so freakin’ cold out! Hot chai. A cute ceramic cup. A romance novel (don’t judge). Thick woolly socks. And maybe Oscar, my cat, if he’s not being too demanding for those never-ending chin-scratches he likes. If you’ve never tried brewing your own before, you’re in for a treat. Masala means ‘spice mixture’ and chai means ‘tea’. Spiced tea. 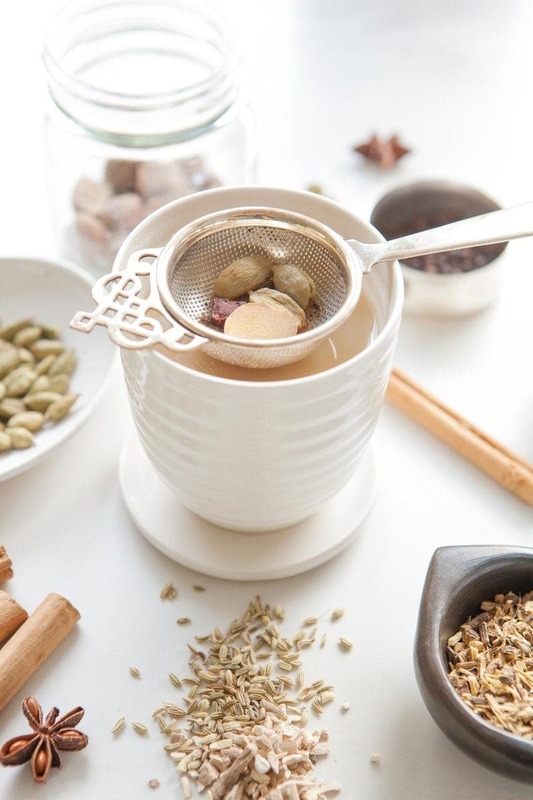 Masala chai is brewed with black tea and a variety of warming spices such as ginger, cardamom and fennel, with milk and a little honey or sugar. It is such a lovely ritual to enjoy – especially in the cooler months. 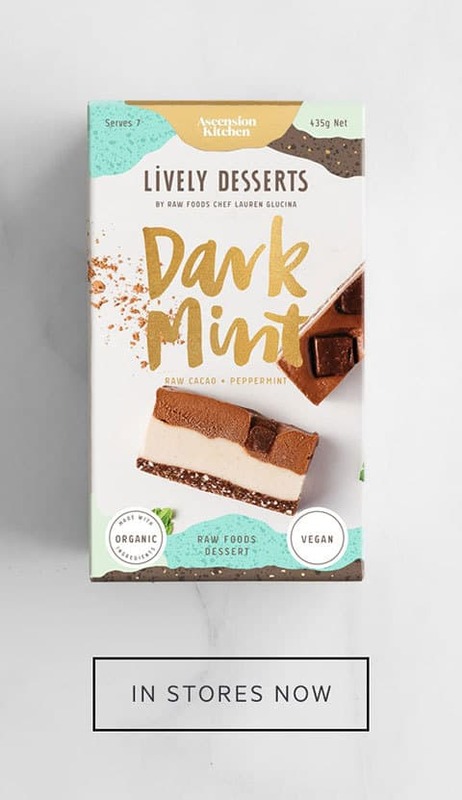 I’ve made a few little changes to make this classic suitable for those wanting a dairy, sugar and caffeine free version. Rooibus makes a lovely substitute for the black tea, and oat milk is creamy and works in place of dairy. Sweeten naturally with honey or coconut sugar if you feel you need it. The spices used in a Masala Chai are warming, energetically speaking . Ginger is the hero of this mixture. Pungent, hot, dry – stimulating yet relaxing. It is a great stimulant to the peripheral circulatory system – relieving cold hands and feet. It is anti-nausea, promotes gastric secretions, and can induce sweating. It’s a great spasmolytic, easing gastrointestinal spasms. It is a strong anti-inflammatory agent . Ruled by Mars, Fire element. Cardamom is a classic chai spice, and is also one of the most expensive ones. 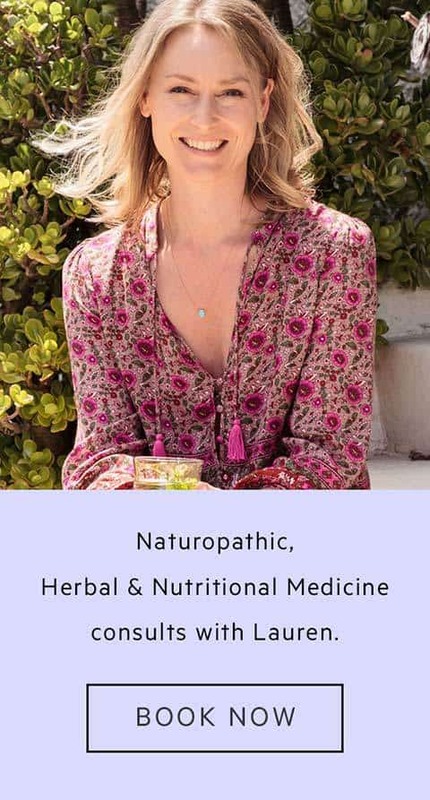 It has a long history of use in Ayurvedic and Chinese medicine, and is particularly useful as a digestive carminative (to ease bloating and expel gas) . Ruled by Venus, Water element. 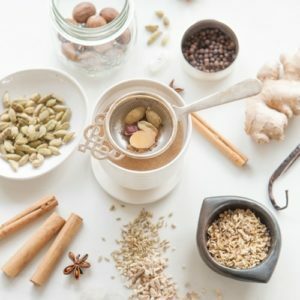 A note on spices – choose the best quality, organic spices in their whole form – and they will be rich in their vital life force energy, or prana. Cinnamon is hot and dry. As a hot stimulant, it helps generate warmth and improve the circulation. Taken in a hot drink, it will promote sweating to relieve conditions such as the common cold . Cinnamon is also traditionally considered an aphrodisiac, perhaps for its circulatory stimulating properties. It is astringent (draws tissues together), and in this way can help ease diarrhoea. It also relieves nausea and vomiting, and has carminative actions, helping to dispel gas and remedy bloating in the gastrointestinal tract [2, 3]. Ruled by the Sun, Fire element. Fennel is pungent, sweet, warm and dry. It is used therapeutically for digestive and bronchial complaints , . It helps stimulate the appetite and is particularly useful to help ease gas and distension. A simple tea made from fennel seeds can help stimulate breast milk production . You can also chew on the seeds to freshen the breath. Ruled by Mercury, Fire element. Star anise has a similar taste to licorice, and is a spice native to Egypt, the Mediterranean and western Asia. It was used by Romans to aid digestion. Said to ease bloating and expel gas, ease intestinal spasms and relieve coughs . Ruled by Jupiter, Air element. Nutmeg is a seed from an evergreen tree, with a warm and aromatic flavour. It was once considered a sure cure for the plague – I’m not quite sure I would put all faith for recovery from such an illness with one little seed, although it has been shown to have some antibacterial activity. It is also useful for treating gas and diarrhoea, and has a sedative effect, calming the mind . Ruled by Jupiter, Fire element. Black pepper is pungent, hot and dry, with astringent and stimulating actions. It generates warmth, dispels cold, clears discharge and relieves fluid congestion . A great spice to use in support of the digestive system. It also contains the constituent piperine, which has been shown to improve the bioavailability of certain nutrients. It was used in Ancient Greece as a currency and sacred offering and was known as the ‘king of spices’ during the Spice Trade . Vanilla is not a traditional chai spice but it adds a lovely flavour. Did you notice that the spices above are a mixture of different planetary rulers and elements? A Masala Chai is typically balancing therefore for all doshas / constitutions. This recipe is best prepared as a decoction rather than an infusion. 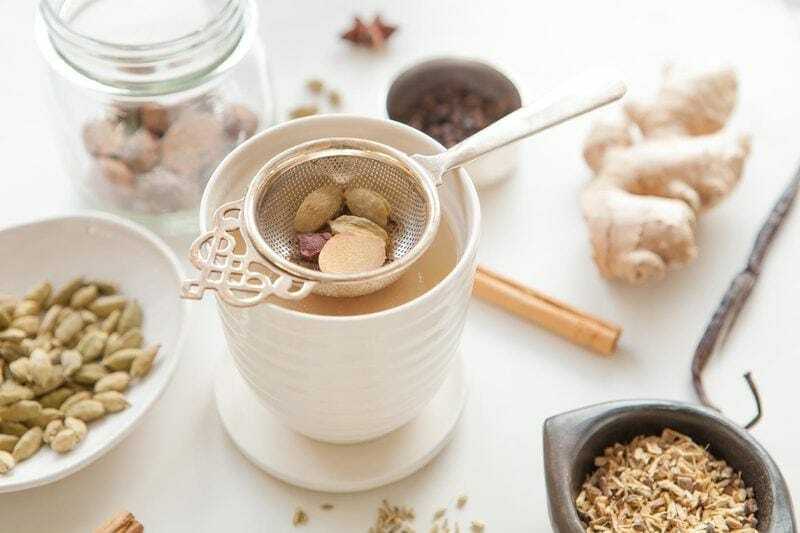 In making an infusion, you pour hot water over your plant material (generally, leaves, buds and flowers), and let it steep for about 5 minutes. In making a decoction, you add the plant material to boiling water, and simmer away for 15 to 20 minutes. The longer extraction time allows the rich flavours and constituents to be extracted from the herbs. A lovely warming Masala Chai made with rooibus to make it caffeine free, and oat milk to make it dairy free. Serves 4 (double the recipe if you want to keep some in the fridge to re-heat). 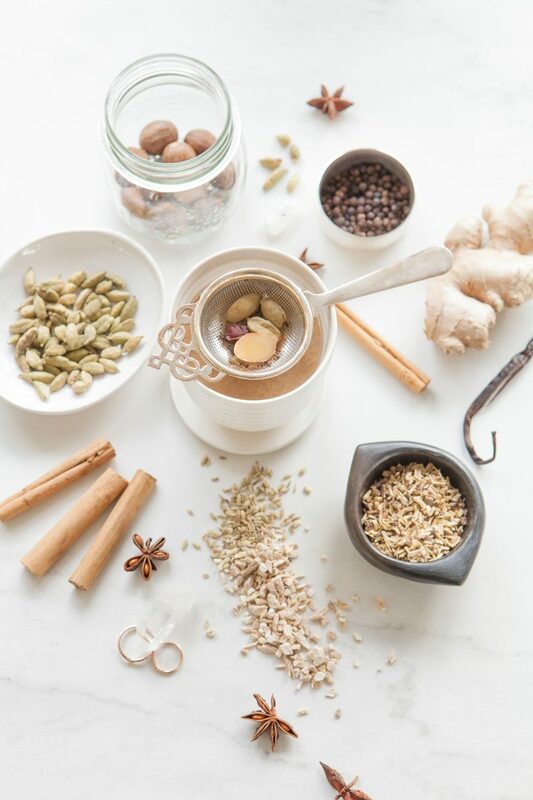 Place the cardamom pods in a mortar and pestle and give them a gentle grind to break them open and release the seeds, then add to a pot with the 3 cups of water. Grind the star anise and fennel in the same way, then add to the pot. Slice the vanilla bean lengthwise, then add to the pot along with the grated nutmeg, cinnamon, ginger, and peppercorns (basically everything but the rooibus/black tea and oat milk!). Bring the water to a boil then reduce to a simmer, cover slightly and leave it to reduce to about 2 cups – this may take between 15 and 20 minutes. Add the oat milk and black tea, bring the water to a boil again then reduce to a simmer for five minutes. You can save the herbs and spices for a second brew – drain them well, pop in a zip lock bag and store in the fridge or freezer. If you are after a delicious chai-spiced cake to serve with this tea, then you may like to try my raw Yogi Cake.